Written by Ben Sisario and Karl Russell — There is plenty of good news in the music industry’s latest sales report released this week. Streaming is up. Vinyl has continued its unlikely renaissance. And did we mention that streaming is up? But a closer look shows that the big sales numbers that have sustained the recorded music business for years are way down, and it is hard to see how they could ever return to where they were even a decade ago. Revenue from music sales in the United States has hovered around $7 billion since 2010, according to the Recording Industry Association of America. For 2015, the number was $7.02 billion, up slightly less than 1 percent from 2014. Within that steady total, however, have been drastic shifts in listener behavior. CDs and downloads have been gradually abandoned as streaming has become the platform of choice. Streaming — whether through paid subscriptions to Spotify or Rhapsody; Internet radio from Pandora; or even videos on YouTube — now makes up 34.3 percent of sales, edging out digital downloads as the industry’s biggest source of revenue. In 2015, the year that Apple Music arrived and Tidal was reintroduced by Jay Z, paid subscription services generated $1.2 billion in sales in the United States. After adding in free streaming platforms and Internet radio, the total for streaming is $2.4 billion. Getting people to subscribe en masse to streaming services has been a priority for record labels and the streaming companies alike, who have often claimed that by building robust subscriber ranks, they would eventually return the industry to its former glory. 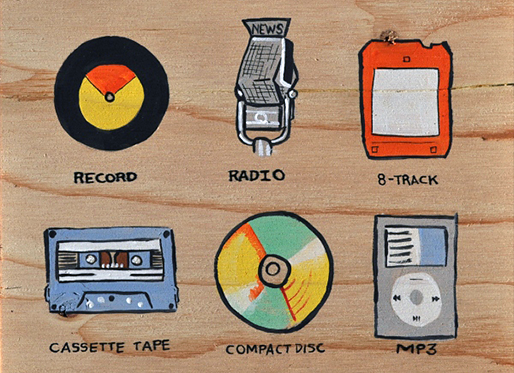 What gets lost in the battles over fractions of pennies, however, is just how much money has vanished from the music business as consumers have abandoned its most profitable product: the CD. In 2006 — years after Napster, and well into the iTunes era — record labels still reaped $9.4 billion from CD sales in the United States, more than the total sales revenue of the business today. 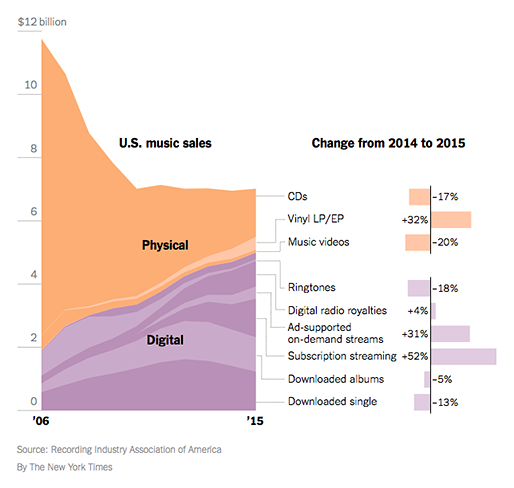 Last year, CD sales stood at just $1.5 billion, a drop of 84 percent in a decade. And downloads, also once viewed as the industry’s savior, have now been falling for three consecutive years with no sign of recovery. In a note accompanying the recording industry’s report, Cary Sherman, the group’s chief executive, criticized sites like YouTube — characterized in the report as “on-demand ad-supported” — for what he described as paltry payouts compared to their enormous popularity online. Last year, YouTube and sites like it generated $385 million in royalties. In comparison, vinyl records — a niche if there ever was one — brought in $416 million. It may be possible for the music industry to wring more money out of YouTube. But it seems doubtful that it will ever earn back what it has lost from the CD.